I’ve finished the research portion of my trip to Ecuador and so much has happened in this last week that I wasn’t able to write while still in the rainforest. I am now in Quito, I arrived last night, and as it is again dark out I´m going to stay inside and write a nice long update about all of the adventures of my last week in the rainforest. When last I wrote I was still working at the Yasuni Scientific Station run by the Catolica University. Kenny and I were busy mapping the trail systems with GPS points that will be uploaded into a GIS file available for all future researchers to use. Shawn and Bejat were still in Quito and Shawn was just starting his trip back to us. On Friday (the 28) Shawn returned and was excited to hear about all of our progress which made all of the long hours in the field well worth it. We also had another large yellow footed tortoise to show him, which was really exciting. He showed us a much more effective way of extracting blood from it and we were able to process it without a problem. Friday was spent with much catching up of stories. It was excellent to have him back. On Saturday things got a bit more exciting. In the morning Kenny and I went back out on the trails to finish taking a few GPS points, but after lunch Shawn decided to take us to the canopy tower that Kenny and I hadn´t been able to find on our own earlier on in the week. The hike out was very easy. The tower is several kilometers from the station but most of the hiking is along the oil road so it was relatively easy going. We found the trail head without a problem and made it into the tower fairly quickly at about 3:30. Catolica’s tower is very different from the towers at TBS. At Tiputini, tower 1 is a platform built at the top of a tree with an ascending metal staircase switching back on itself every 6 stairs (yes, I counted every one of every floor). Tower 2 is built entirely out of wood with a long staircase spiraling (in square fashion) around another tall tree with three platforms at the top (no, I wasn’t able to count all the stairs of each flight as some had rotted out… yikes). The tower at Catolica, instead of using nice stairs, was a single 100 foot long steel ladder stretching straight up into the tree canopy. At every 30 feet or so there would be a platform – really just a steel mesh about 1.5 inches square forming a landing about 12 feet to a side. I stopped at the first one to try to get my head around climbing all the way up the ladder but found stopping far worse. The ladder pierced each level through a gaping hole in the mesh so getting off and getting on was even more frightening. After the first platform I was ready to go down but I knew I´d regret it so I just forced myself to get back on the ladder and climb the rest of the way without stopping. It was terrifying looking down to place my feet (in big rubber boots that were a bit too big for me and covered in mud) and seeing 60, 70, 80, 100 feet of ladder stretching down below me with nothing between me and the ground. It was the hardest climb I have yet to do. I made it to the top and my forearms were cramped because I was holding onto the ladder so hard. The top was another mesh platform and I had to sit by a railing and look out to get my head back in order. It was extremely challenging, but gave me a real sense of accomplishment. I feel like I’ve finally forced myself through my fear of heights and am thoroughly enjoying the increased freedom because of it. The view up top was very nice. The sun was low on the horizon and cast beautiful pinks and oranges through the clouds all around us. We were again surrounded by a patchwork of greens from the tops of all the nearby trees but the view was a bit different. We could begin to see a few cleared areas in the distance and other marks of the oil company and settlements. Unfortunately this area is much more heavily disturbed than the forest we so enjoy at TBS. As the light was failing we decided it was time to start the climb down. I had Shawn and Kenny go first so I could take my time. The hardest part was getting onto the ladder. The only way was to sit down with your legs dangling through the hole in the platform, put them on the closest convenient rungs of the ladder and swing yourself on. Easy to say but in practice it was much harder. Eventually, again, it was just a matter of doing it. To make matters worse, as Shawn and Kenny started down the ladder, we noticed a thunderstorm gathering in the distance and streaks of lightening dropping out of the sky with uncomfortable regularity. The thunder came rumbling over us after quite a pause so the storm was a ways away but thinking about holding onto a 100 foot steel ladder during a lightening storm did not make the prospect of the climb down any easier whatsoever. I made it down without a problem but I was sure glad to be off that tower. It took me a long time to breathe easily again and for my arms to unclench. I had blisters on my palms from the steel rungs for several days. By the time we reached the road it was properly dark. Between the three of us we only had one light – oops, but as we were on the road we weren’t too concerned about losing our way. About half way home Kenny froze in mid-step just before putting his foot down on what looked like a fallen branch when he realized that the branch had moved, it was a snake. He gave a shout and we shined the light on it to identify it – a coral snake and extremely venomous. Much to Kenny´s surprise and my concern Shawn said “let´s catch it, do you have a bag?” We were woefully underprepared unfortunately without tongs or a proper snake bag but I kept the light on the snake and Shawn started corralling it – it was by this time doing it´s best to get off the road and out of the light while Kenny dove into his backpack to find a bag. All he could come up with was a 2 gallon freezer ziplock bag. At this point most sane people would call well enough alone, get a good look at the snake and let it on it´s way, but Shawn grabbed the bag and started trying to corral the snake into it. A scary proposition as he needed to hold the bag open with his hands. Coral snakes are notoriously difficult to catch because they have a tendency to be rather spastic in that they´ll move irregularly and somewhat unpredictably when cornered. It was extremely nerve-wracking jumping along behind with the headlamp trying to keep the light on the snake so Shawn could see what he was doing, knowing full well that if for some reason the snake bit his hands it would mean a dash for the hospital many hours away. Somehow he got the snake in the bag and got the bag closed. We all breathed a huge sigh of relief and Shawn told us “Never, ever try that yourselves.” I think I won´t. I´m glad we did though because Shawn has never seen the snake before and we couldn’t find it in any of our reptile books. I doubt its a new species but it is certainly rare. We´re going to have to send pictures to an expert to have it ID’d. Sunday was our last full day at Catolica and it was spent filling in the gaps in some of our data. I went out in the morning looking for three trees in the forest dynamics plot that were missing data. It took me forever to find the trees because they were quite spread out and the previous research assistant wasn’t very apt with the compass. Many of the bearings were reversed either by 180 degrees or just flipped on the other side of north… it was all very confusing and required a lot of time to sort out. As there were also some GPS points to catch Kenny did that and I got to find the trees by myself which was exciting but also a little nerve-wracking. It is so easy to get turned around out there! I made it back in one piece though and spent the rest of the day mapping the trails and packing. The next morning, moving day, was pouring rain. Shawn has some 350 lbs of gear of his own and on top of the luggage that Kenny and I have we had to take several trips to the dock in rain so heavy the drops were almost painfully stinging. To make matters worse the boat was 3 hours late picking us up as someone had forgotten that we needed to be collected. By the time the boat came we were thoroughly soaked but the sun started coming out and we were happy to be heading back to Tiputini. Sharing the boat with us were 15 students from a small university in Ohio on a tropical ecology class. It was fun to watch them excitedly taking pictures of the never-ending walls of vegetation on either side of the river as we boated for 2 hours downstream. It made me realize again just what an incredible place this was when I started looking at it again with fresh eyes. It was a fun trip for that reason alone. On Tuesday, Shawn decided to let Kenny and I climb one of his trees to recover several data loggers – nickel sized instruments used for measuring temperature or humidity (or any number of other things). He had placed the loggers in two trees 6 months ago and now it was time to download them and shift them to other trees. I got to climb up first. The climb was beautiful and much more smooth than had been my first climb. The tree was quite tall – about 43 m . and my bromeliad was almost at the very top. There were three data loggers wedged into different bracts of the bromeliad so I had to haul myself to just above and pry through the extremely spiny bracts looking for the bit of flagging tape marking a logger. I was extremely happy to find the three fairly quickly and pocketed them without too much adventure aside from a few thorns in the fingers. The last data logger I had to collect was strapped to the trunk of the tree just next to the bromeliad. This took a bit more finesse as it was out of arms reach from the rope. When we climb we also climb with a lanyard – just a really long rope hooked onto our harness with carabiners and two cramping irons. The lanyard is used by detaching one end from your waist and tossing it around a branch and then reattaching it to your hip. You can then “reel” yourself in with the cramping irons – or at least that´s the theory. Again, in practice, this was a whole lot harder than it sounds. I had to use the lanyard to collect this data logger. Because there were so many bromeliads around the target branch I wanted to pull myself towards I wasn’t able to toss the rope around. Every time I swung it it´d just get caught up and tangled. With some effort I was eventually able to start swinging a bit on the rope, grab onto a bromeliad and bear hug the goal branch. At this point I was planning on passing the rope from hand to hand on the far side of the bromeliad and thus form the necessary loop. The attempt earned me a face full of bromeliad, spines and all. It took all of my strength to keep a hold of the branch with one hand while passing the rope with the other all the while getting raked with spiny bracts about 120 feet off the ground dangling from a single rope. It was very exciting. Somehow I managed to do it. In the process I also dumped the entire contents of one of the bromeliads – usually about 2 L of water down the front of my shirt. By the time I started reeling myself into the branch and removing the data logger I was soaked, scratched and swarmed (the sweat bees had by this time begun thoroughly enjoying my presence). Despite all that, I loved being on the lanyard. In fact, it was some of the most fun climbing I’ve had. Unfortunately I didn’t have much time to experiment but between the lanyard and and main climbing rope you can safely maneuver to almost any part of the tree. In addition, being anchored to another point on the tree was also extremely relaxing as I no longer had to worry about swinging to and fro or spinning around and around. I will definitely want to experiment more with the lanyard if I can do more climbing some time in the future. That night Shawn and I went on a great herp walk and found two beautiful (non-venomous) snakes, a salamander and a frog, both of which were very rare specimens. It was a great night! Wednesday was our final day off and Kenny and I decided to enjoy it by going swimming down the Tiputini river. Our original plan was to hike upriver several miles and then just jump in and float back down to the boat launch. While this has been attempted many times in the past (most of which were successful) the current is actually quite swift especially as the water was very high with all the recent rains, so we were a little anxious about the idea. We then found out that the student group was going to do a nature watching float down the river and that there would be a chance to jump out if we wanted to, so we joined up with them. The float was very nice. We saw tons of birds and it was extremely relaxing, though Kenny and I were peppered with questions about how we got this researching job, what we were planning on doing in the future and many other things by the students. It was fun to talk with them and share in their enthusiasm. And they were very enthusiastic, in fact at least two of them had DNA themed tattoos – one of whom had, yes, a DNA helix stretching around his bicep. We were in good bio-dork company. I was a little nervous about just leaping off the side of the boat and into the water but they had everyone wear lifejackets so we were quite safe. We kept an extremely careful eye out for caiman and anacondas but didn’t see a single one. we floated down river for most of 2 hours and it was gloriously relaxing and refreshing. I was actually more concerned about the microorganisms than the carnivores but those don´t seem to have been a problem either – Whew! It was an extremely memorable morning. In the afternoon Shawn decided to let me set the climbing line in the next tree he would be putting the data loggers into. How do you set a line in a 130 foot tree you might ask? You use a big shot – a 9 foot long slingshot on a pole. The band was so strong on the sling that to set it in the trigger mechanism required almost all of my weight. Finally we got the sling locked into position and the 500 g bag of steel ball bearings loaded and ready to go. The next step was aiming the thing. I had to sit down on the ground holding the catapult between my legs straight above me and sight along the pole by putting my chin directly on the pole opposite the sling that I was about to release. I then had to hold my chin there to steady the pole while I pulled the trigger (which was just a 4 inch piece of string) causing the sling to be released and the shot to go flying out. The anticipation was tremendous. Plus, the angle had to be just under 90 degrees in order to get high enough in the tree but not a full 90 or else the shot would come crashing down on top of you without really any warning which would no doubt leave a dent. The difference was really only a degree or two and when you´re holding a 9 foot pole worrying about a degree of difference is quite a concern. I was really nervous but it ended up being much more fun that I had thought. My first shot was short, I shot low (most likely at something like an 85 or 86 degree angle) and so the shot went over a branch but it wasn’t the branch that we wanted. Oh, I forgot to mention, the target was a tiny crotch of two tree branches about 125 feet up, partially obscured by leaves both in the canopy and the understory, aiming required much consultation with a pair of binoculars. My second shot, somehow, managed to go right into the crotch and over – a perfect placement. To be honest, neither Shawn nor I could quite believe it. I´m pretty sure it was just luck. Actually I was a bit disappointed as I´d have liked to use the big shot a few more times, but the thrill of getting it on the second try outweighed that. After the big shot it was time for dinner. After dinner, I decided to head out to sleep in tower 1. I had flirted with the idea of spending the night in one of the towers for about a week by this point but didn’t know if I´d actually be able to manage it. After such a good day though I decided I had to try. The weather looked promising and when was I ever going to be able to spend the night in the rainforest canopy again? I hiked out with the tent we use for disassembling bromeliads. It is entirely mesh without a fly and so serves really only as a mosquito net with poles. I also had a blanket, a pillow and my camera. First of all the hike out, in the dark, alone, was quite a thrill. Every nightly noise ( and there are a lot of them in the jungle ) gave me a little start and I was constantly on guard and watching my surroundings. By the time I reached the tower – not quite a kilometer away – my senses were acutely tuned and my nerves a little raw but I wanted to keep going. The climb up the tower was extremely easy. Compared with the ladder from the last tower the nice sturdy stairs were no problem. The darkness swallowing the ground beneath me made the climb somewhat easier as well. When I made it to the top of the tower the moon was just setting but still cast enough light to set the tent up. I took many pictures of the moon and the night sky – it was a cloudless night and the stars were breathtaking. It was magical to be so high up in the canopy, surrounded by trees below and wrapped with stars above. Worthy of poetry if I could find the right words. The air was warm and there was no breeze – the night was perfect. Just after the moon set for good a small meteor shower started and I saw about a dozen shooting stars arc above before falling asleep. I awoke just as the sun was pinking the eastern horizon and jumped up to try to get some pictures. There were a few fluffy clouds now – all the better for photographing and I had a great time trying to capture the moment. Eventually though I just gave up trying to get the perfect picture – it was impossible I think, and just sat on the platform with my socked feet hanging over the edge (how far I’ve come in terms of fear of heights) and reveled in the rising sun. 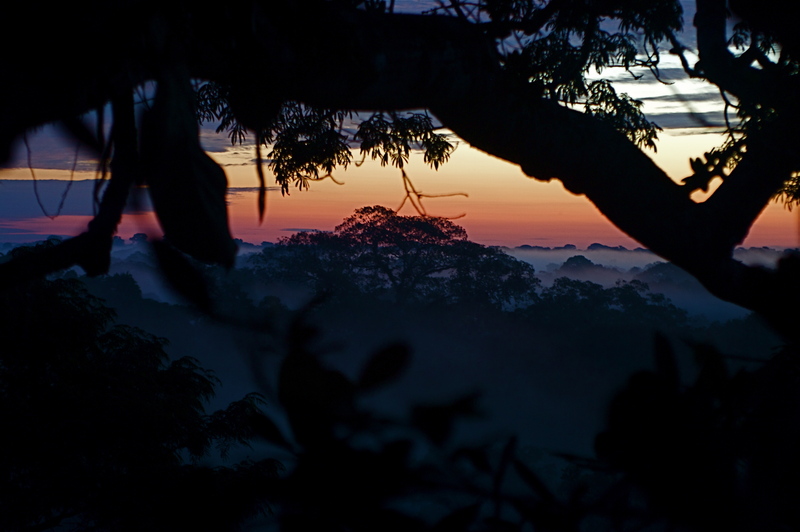 It was a beautiful moment, one that I won´t soon forget and was a perfect cap to my time in the rainforest. I don´t know how I got so lucky. Thursday was my last day at Tiputini, and as I am on a communal computer and there are people waiting to get on I´ll have to brush through the account somewhat more quickly. I apologize for the many typos – I´m using a spanish keyboard and am trying to write as quickly as possible. Still, this note has gotten rather long and unwieldy. We climbed another tree on Thursday, Kenny and I. This time Kenny took the lead and I went up after he was finished. There was only one bromeliad to recover the data loggers from so I just climbed up the tree to take pictures and to get one last climb in. We were absolutely beset with the most sweat bees yet and I could hardly breathe let alone play around with the lanyard. I did practice a few times switching between ascenders and descenders – a tricky but important skill to master and I took a few pictures, but after only about 20 minuets I was ready to head down again. The rest of the evening was spent packing and cleaning up the lab a bit. Kenny and I were leaving but Shawn was going to stay for another 2 weeks at TBS to be joined by his wife before they head back to the states just before Christmas. Friday morning dawned too early and Kenny and I, immediately after breakfast, got onto the boat and motored away from TBS. I was extremely sad to leave Tiputini and Shawn. I have had an amazing 6 weeks in the rainforest. I have learned so much about tropical research and herpetofauna. It has been invaluable that way. I’ve also had an amazing time bouncing research ideas around with other really enthusiastic bio people and have been able to give much more shape to the research I want to do in grad school. While I don´t think I´ll be researching in the rainforest I have learned an incredible amount and have seen some phenomenal sights – I feel extremely lucky. I am now safe in Quito awaiting the arrival of my mother on the 8th. I´ll send another update in a week or so, internet access permitting but I am extremely excited to travel with her and see some more of the country. Especially the cloud forests and the highlands. I hope you all are well. I can´t wait to get back to the states to tell you more about my adventures and share my pictures with you.